When Alexander Fleming discovered Penicillin in 1928, many declared the war against infections and harmful microorganisms to be over. No longer, they thought, would people needlessly die from curable infections now that they had a secret weapon at their sides. But of course it was not to be so. Researchers discovered the first penicillin resistant organisms just a little more than a decade later, and within two decades, resistance to penicillin was widespread. In the five or more decades leading up to today, every single antibiotic that has been produced and consumed by humans has had described cases of resistance. Even the brand new ones; even the really ‘strong’ ones. Over at infectionNet we wanted to help do something about this, so we’ve been working hard on a contribution of our own. 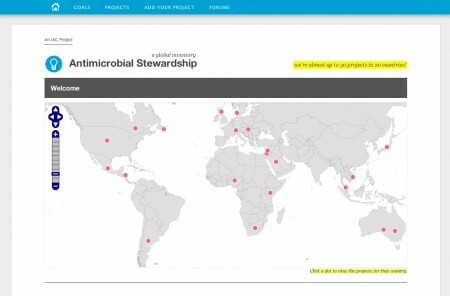 Yesterday we launched a global inventory of projects that promote proper use of antimicrobials. Our goal over the next few months is to highlight the work of people around the world, give them a voice for their ideas, and applaud them for their efforts in combating a global problem. Sure, the web is a huge place, and this is just one small corner of it. But that’s where you need to start: small. All of the world’s big ideas started the exact same way.